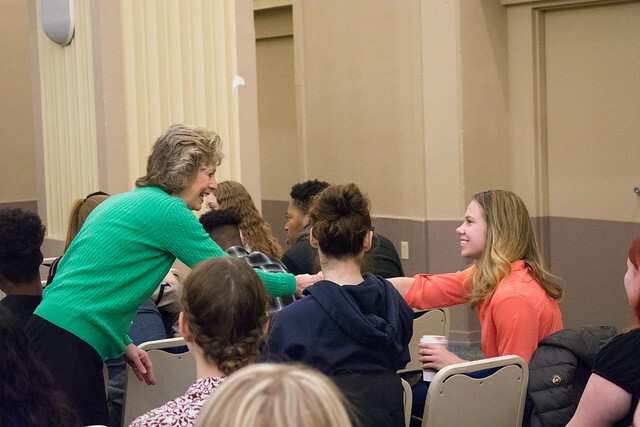 Students connected with sports professionals and learned about important topics in the field at the inaugural Emerging Trends in the Sports Industry seminar March 27. The seminar kicked off with keynote speech on “The #MeToo Movement and the Sports Industry” by Buffy Filippell, founder of TeamWork Online, an industry leader in web-based talent recruiting for sports and live events. Filippell shared her personal experiences of sexual harassment in the workplace and discussed equality research she has done with her company. “While there is no ironclad protection from sexual harassment, climbing through the organization in a revenue-generating role affords women real power to influence a community and its employees,” Filippell said. The event was organized by more than a dozen sports, arts and entertainment management students and led by Jessica Martin ’17, SAEM alumna, M.B.A. student and Rowland School of Business graduate assistant. “Planning this event was an educational opportunity and a way to give back to the SAEM department. Not only does the SAEM department recognize the benefit of bringing the City of Pittsburgh to our campus, but the University community as a whole also welcomes the idea and fully supports it,” Martin said. 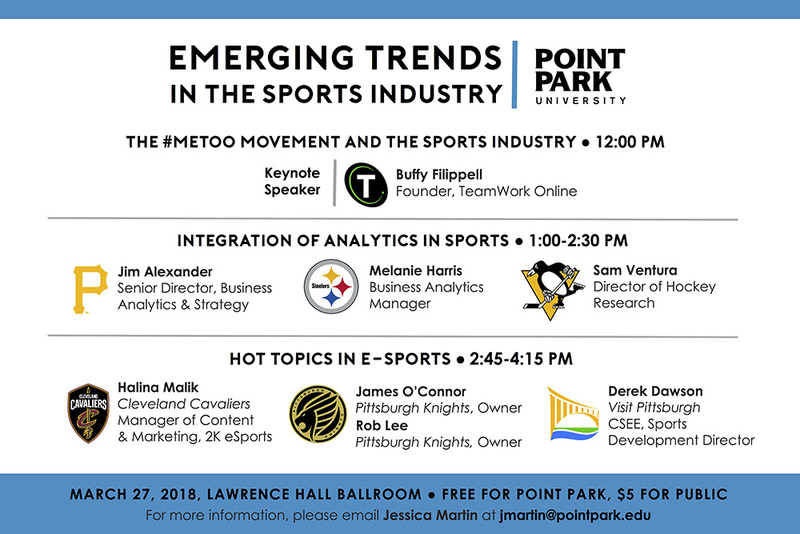 “We were very fortunate to have directors, managers and owners from the Pittsburgh Pirates, Pittsburgh Penguins, Pittsburgh Steelers, Visit Pittsburgh, Cleveland Cavaliers and the new Pittsburgh Knights organization serve as our panelists and share insights on their areas of expertise,” said Robert Derda, M.S., SAEM assistant professor. “I was most interested in the analytics discussion because I aspire to study business analytics in graduate school,” said Alexis Diaz-Albertini, a senior SAEM major from Marian Catholic High School in Chicago Heights, Ill.
Madison Winger, a freshman SAEM major from Oil City High School in Oil City, Pa., said her favorite part of the seminar was Filippell’s keynote speech. “Ms. Filippel spoke about her failures as well as her successes and how it all led to her being the founder of TeamWork Online. I also liked that she talked about influential women who have paved the way for women working in the sports field,” she said.